Just before Christmas I spent some time at St Flannan’s Holy Well at Errislannan in the company of archaeologist Will Anderson. Errislannan is a small peninsula, on the west coast of Co Galway, in the Connemara region, a few miles from the town of Clifden. Errislannan or Iorras Fhlannáin in Irish, means “Flannan’s Peninsula”. The area gets its name from the seventh century St Flannan who according to local folklore spent some time in the area before settling in Killaloe. The saint is also the patron of a ruined the medieval church and holy well. The church and holy well are located on the shores of Lough Nakilla in the townland of Kill. Today the church and surrounding graveyard are overgrown with briars and dense vegetation. We managed to get into the interior of the church which appears to be a rectangular structure, without any internal division. It was impossible to examine the fabric of the building in any detail but a number of gravestones were visible at the eastern end of the church. View of the interior of the St Flannan’s church at Errislannan. Small poorly preserved medieval church (E-W; L 10.3m, Wth 4.5m) dedicated to St Flannan of Killaloe. The only surviving features are a plain doorway in N wall and the Morris family tomb in interior. The oldest part of graveyard, oval in plan, surrounds the church. To S of church is a leacht consisting of a drystone wall (L 2.5m, H 0.5m) with a niche, set into the natural slope. A natural boulder, known as St Flannan’s Bed, lies c. 100m E of the graveyard and there is a holy well (GA035-048003-) to E.
According to the seventheenth century Chorographical description of West or H-Iar Connaught by O’Flaherty, Roderic, 1629-1718, ‘the church has no burials within the walls‘ due to a belief that the body would not stay buried and would be found on the ground the next say. During the ensuing centuries this belief changed and today there are a number of grave markers in the interior of the church including the Morris family tomb. The heavy growth of vegetation made it impossible to examine these stones. The Morris family were landed gentry who had inherited part of the estate of the Frenchs of Errislannan and they had a house in Ballinaboy. The surrounding graveyard was also very overgrown and I couldn’t find the leacht. On the west side of the medieval church and historic graveyard, is a modern walled cemetery filled predominantly with modern marble and granite gravestones. 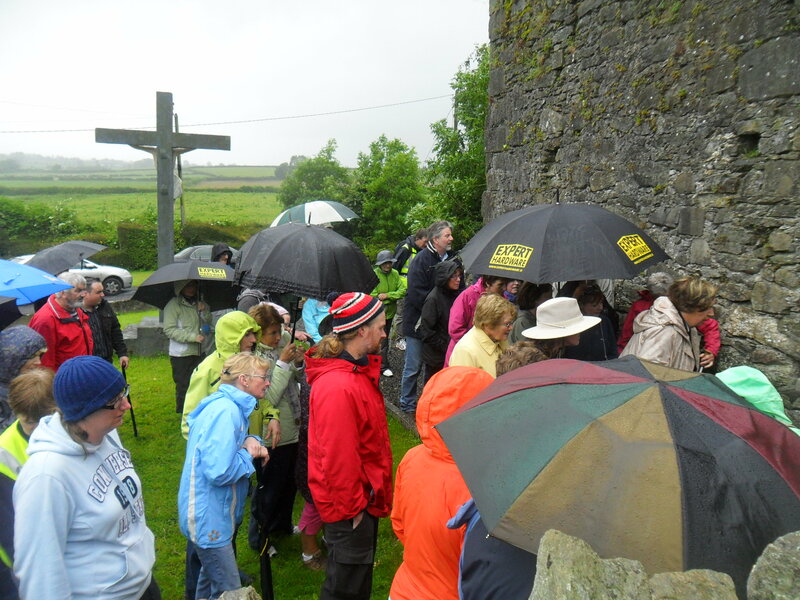 St Flannan’s holy well is located close to the gate leading into the modern burial ground. The holy well was once a place of pilgrimage on the 18th of December and we came here on this day to see if people from the area still visit. Unfortunately I didn’t see anyone here but some pilgrims could have visited before or after my visits. 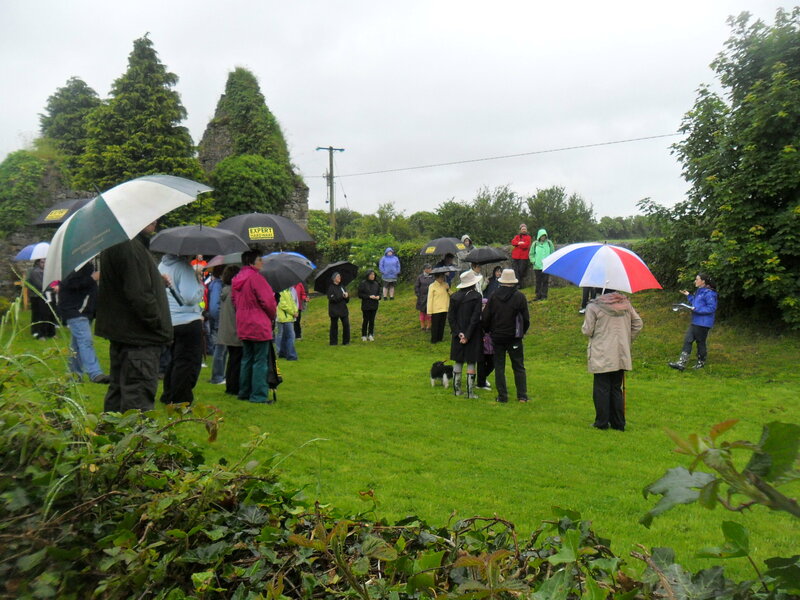 It was a very wet day which could have been a factor in the lack of activity but I was told by some people in Clifden that the tradition of visiting the well on the feast day has all but died out here. The well itself is a rectangular stone lined feature with steps down into the interior. It is in turn surrounded by a low dry stone wall. The well has the most charming appearance which is enhanced by its lakeside location. Evidence of recent visits by pilgrims to the holy well are represented by a broken saddle quern on the external wall of the well, filled with votive offerings of coins (mostly euro currency) and the odd religious medals. I must come back here again during the summer or on a nice sunny day as the location of the well is stunning and there is a real sence of peace and calm. The sleepy Augustinian Nunnery at Molough just outside of Newcastle was a hive of activity today. A historical and archaeological tour of the abbey took place as part of the annual Éigse festival. Despite the rain a large crowd still turned out. 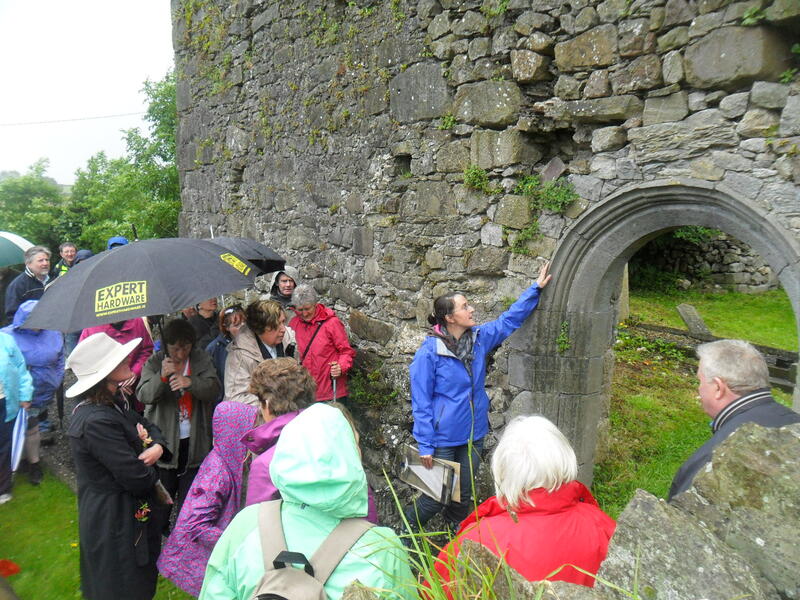 Breda Ryan talked about the history of the nunnery and I gave a tour of the the site. The monastery was dedicated to St Brigid and was founded in the early medieval period by the daughters of the King of the Deise. It appears to have been re-founded in the early part of the later medieval period. The present remains consist of a 13th century church, a cloister and two domestic buildings on the east and west side of the cloister. The church has a number or single light sandstone windows and a beautiful 15th century carved limestone doorway. There are traces of painted plaster work in the east window of the south wall. 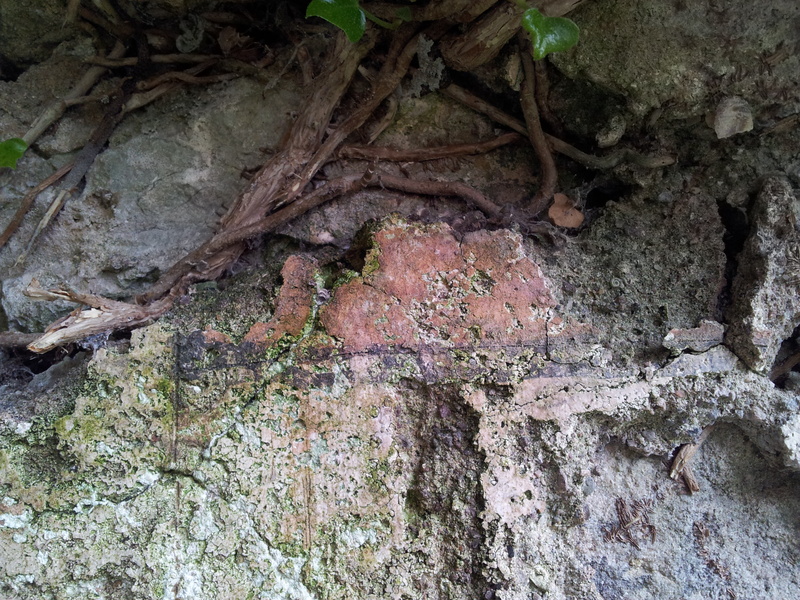 The paint is orange/reddish colour with black horizontal lines which appears to trying to imitate ashlar masonry.